During your opponent's Battle Phase: You can banish this card from your Graveyard; end the Battle Phase (this is a Quick Effect). You can only use this effect of "Electromagnetic Turtle" once per Duel..
You can Ritual Summon this card with "Black Luster Ritual". .. Cannot be Normal Summoned/Set. Must first be Special Summoned (from your hand) by banishing 1 LIGHT and 1 DARK monster from your Graveyard. Once per turn, you can activate 1 of these effects. :- Targe.. If you have "Right Leg of the Forbidden One", "Left Leg of the Forbidden One", "Right Arm of the Forbidden One" and "Left Arm of the Forbidden One" in addition to this card in your hand, you win the D..
Flip all monsters your opponent controls face-up. This card remains on the field for 3 of your opponent's turns. 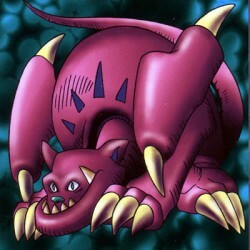 While this card is face-up on the field, monsters your opponent controls cannot declare..
Target 1 monster you control that is owned by you; if that monster is still on the field, shuffle it and your entire hand into the Deck, also, after that, draw cards equal to the number of cards you s..